In this article we are going to tackle the question about the Middle-East, Islam and terrorists. We’ve all seen things like ‘Not all Muslims are terrorists, but it seems all terrorists are Muslim’. First of all some housekeeping, Lets get a couple of things straight Islam and Muslim – what’s the difference? To put it simply, Islam is a verbal noun, Used to describe the religion and things done in the name of the religion. Muslim is a verb, Describing a person who subscribes to the Islāmic faith. So Christianity is to Islam as a Christian is to Muslim. (That should ruffle a few feathers). Although terrorism has no legally binding definition it is generally understood to describe acts intended to create mass fear or terror among a population. While the modern media seems to use the words terrorist and Islamist interchangeably it wasn’t always this way. Throughout history acts of terrorism have been used all over the world by all races and religions. There are many acts throughout history that can be described as terrorist attacks, here are just a couple you may not have heard of. Wisconsin Sikh Temple massacre, Aug. 5, 2012. Sikhs are not Muslims; but to a racist, a bearded Sikh looks like a Muslim as their attire is similarly different to western attire. Only four days after 9/11, Balbir Singh Sodhi, a Sikh immigrant from India, was murdered by Frank Silva Roque, a racist who obviously mistook him for a Muslim. But Sodhi’s murder was not the last example of anti-Sikh violence in post-9/11 America. On Aug. 5, 2012, Wade Michael Page used a semiautomatic weapon to murder six people during an attack on a Sikh temple in Oak Creek, Wisconsin. Attorney General Eric Holder described the attack as “an act of terrorism, an act of hatred.” It was good to see the nation’s top cop acknowledge that terrorist acts can, in fact, involve white men murdering people of color. The murder of Dr. George Tiller, May 31, 2009. Tiller had a long history of being targeted for violence by terrorists. In 1986, his clinic was firebombed. Then, in 1993, Tiller was shot five times by female terrorist Shelly Shannon but survived that attack. The physician was shot and killed by anti-abortion terrorist Scott Roeder on May 31, 2009. Another member of the same movement Paul Jennings Hill, was executed by lethal injection on Sept. 3, 2003 for the murders of abortion doctor John Britton and his bodyguard James Barrett. The Centennial Olympic Park bombing, July 27, 1996. Eric Rudolph, who is serving life without parole for a long list of terrorist attacks is responsible for a blast that killed spectator Alice Hawthorne and wounded 111 others at the Centennial Olympic Park, his bombing of an abortion clinic in Birmingham, Alabama in 1998 caused the death of Robert Sanderson. Suicide attack on IRS building in Austin, Texas, Feb. 18, 2010. Do you know that an airplane was deliberately flown into a government building as recently at 2010? No? When Joseph Stack flew a plane into the Echelon office complex (where an IRS office was located), Republican Rep. Steve King of Iowa joked that it could have been avoided if the federal government had followed his advice and abolished the IRS. Nonetheless, there were two fatalities: Stack and IRS employee Vernon Hunter. Stack left a rambling suicide note outlining his reasons for the attack, which included a disdain for the IRS as well as total disgust with health insurance companies and bank bailouts. Timothy McVeigh and the Oklahoma City bombing, April 19, 1995. 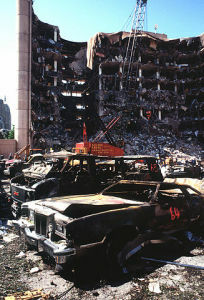 Prior to the al-Qaeda attacks of 9/11, the Oklahoma City bombing McVeigh orchestrated was the most deadly terrorist attack in U.S. history: 168 people were killed and more than 600 were injured. When McVeigh drove a truck filled with explosives into the Alfred P. Murrah Federal Building, his goal was to kill as many people as possible. All of the terrorist attacks mentioned above have one thing in common, They were all perpetuated by Christians. Am I making a point that Christians are terrorists? No, Quite the opposite. The point is that terrorism is not reserved for a particular race or religion. I created the graph above using data from the RAND Database of World Terrorism Activity (1968-2009) and sure enough terrorist attacks are more frequent than in the past with a peak in 2006 the majority of which occurred in the Middle-East. However lets remove all the war-torn countries from the graph and look at Australia, United States and United Kingdom only. While global terrorism is on the rise, The US has had a couple of peaks in the 70’s and again in 2001, The UK has had a reasonably steady amount of terrorist activity and Australia has experienced 1 (one) terrorist incident since 1994 and that was on the 16th of July 2001 an armed security guard at an abortion clinic in Melbourne, was shot and killed by Peter James Knight (born 1 January 1954). Knight was subdued by two bystanders and later arrested. Our increased spending on security has stopped potential attacks and the number would be higher had we not became more vigilant but to what extent can’t be proven. So why then do some Australians have a prejudice against Muslims? The Media. Increasingly post 9/11 news reports have chosen to focus on the religion and nationality of terrorists and blatantly ignored any other reasoning that may have been behind their actions. Do you know why those men flew those planes into the buildings on 9/11? No? Don’t blame yourself, The U.S. government’s 9/11 Commission Report made no attempt to understand what motivated the attacks, It is primarily an analysis of how they failed to prevent the attacks and how they failed to be aware that they might even occur. We are left to believe what the media tells us- The motive of al-Qaeda is some sort of radical Islāmic hatred of the west. The cause of the 9/11 attack and middle-eastern terrorists is not radical Islam; This is a conflict between America and its policy of financial, military and political dominance throughout the Middle East and a small group of guerrilla fighters who view this as nothing less than the theft of the entire region’s wealth. 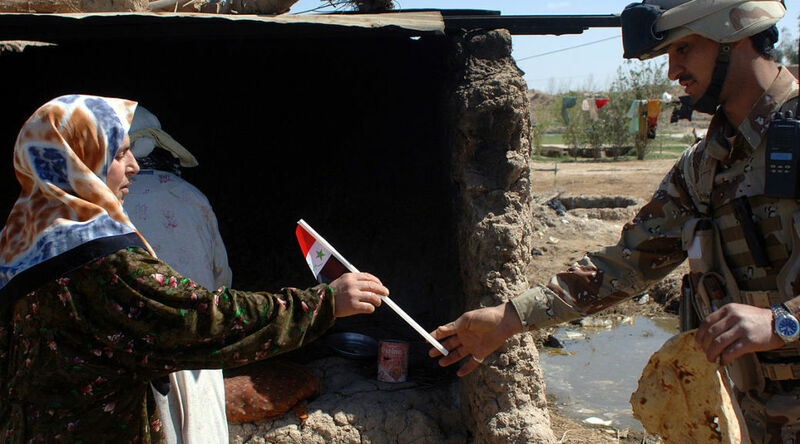 Money – Not religion is the reason groups like al-Qaeda exist, Sure they are religious fundamentalists but its not the reason behind their actions. It deeply concerns me that now we still need to have such deep thought and discussion to make people see it is wrong to judge anybody by their race, religion, heritage or anything that is not their own actions. We don’t judge today’s Germans on the actions of the Nazi’s, nor do we blame today’s Christians on the actions of the Crusades. So why should we blame all Muslims for the actions of a few? Previous PostBudget Emergency!Next PostEvolution? Or Evilution?